Posted September 12, 2013 by okconguest & filed under Invited Speakers, OKCon. This post is written by Mitar Milutinovic, Rodrigo Ochigame, Tony Chen, Xuan An Thi Ho, and Dawn Song. They’ll be talking about their project at the Hackspace at OKCon (times to be decided on Monday 16th), and you can reach them via Twitter or email if you’d like to meet up – they’d love to hear from you! PeerLibrary is an open access project developing a collaborative online community where scholars and researchers can read, discover, and discuss various open access literature all within one site. The project is a response to the question as to what comes after open access. Although open access publications will be opened to the public for gratis access, licensing terms often still restrict the reuse and redistribution of the texts. Scholars and researchers, however, need access to the discussion and discovery surrounding a paper to enhance understanding. PeerLibrary will be a one-stop site where users will not only have access to the original publications but also access to a collaboratively edited layer of knowledge surrounding the publications. Through this integration of multiple sources of knowledge, PeerLibrary will simultaneously enrich the experience of reading research by making it more interactive and open up the possibility for improving publications through peer feedback. Furthermore, by encouraging more community interaction and involvement, PeerLibrary hopes to stimulate discussion on how we can build better open access resources and tools for the general public, not just scholars and researchers. This will enable us to better understand the breadth of usage for all communities that the open access movement seeks to empower. Ultimately, by analyzing which resources and tools open access enables, we will be able to supply the open access movement with more compelling and unique reasons for the immediate investment in its development, which we believe will improve scientific research and its results. 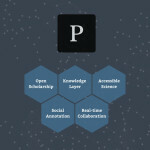 We believe that PeerLibrary will play a vital role in fulfilling the potential of open access to enrich and energize the scientific community, and we will pursue these goals through three specific steps: expediting access to publications, enabling public recordings of analysis and insights on said publications, and encouraging collaboration and openness in the development of science. First, PeerLibrary simplifies and accelerates access to scholarly literature. Our search engine allows users to look up and explore millions of publications in an instant. Crucially, with no subscription or registration needed, anybody can easily access the information in PeerLibrary. After locating the specific work, users can open up the full text, including charts and images, directly in PeerLibrary in the browser. Users are no longer redirected to another site or forced to download files. Additionally, each publication has an easily recognizable URL, so readers can share the publication and increase access to the information that would otherwise be obscure and difficult to discover. By providing all the works in-browser and with no redirection to other sites or applications, PeerLibrary aids in creating simpler and cleaner steps in research. Next, PeerLibrary encourages critical reading and engaging in the text by providing tools to annotate and comment directly on the works. Users can highlight important information and take notes in the margins online, just as how one would mark up a physical research paper. By eliminating the need to print files, the research process is contained in one online medium, creating a greater sense of organization. Furthermore, note-taking tools encourage active analysis, a recording of insights and questions while reading. Users can choose to keep their highlights and annotations private, or they can make them public, which leads into PeerLibrary’s key step in creating a more collaborative and open scientific community. To make science truly open, readers not only need access to publications, they also need access to the additional knowledge layer and general discourse surrounding the publications. The annotations tool allows for real-time collaborative discourse and investigation of a text, not just individual reflection. When a user opens up a publication, he/she will not only be able to make personal annotations but will also be able to compare and contrast his/her comments to others. Public annotations from users will appear on the side of the text, and users can provide feedback about which are the most valuable or interesting ones. By sharing notes, users can see what others think about a work, look for common problems, consider diverging opinions, and ask questions. Often, when scholars and researchers discuss publications, they discover issues or introduce provocative suggestions offline. By moving these thought processes and discussion online, the experience of scientific reading will become more interactive and engaging, which will hopefully produce more thoughtful and innovative academic results. Above all, PeerLibrary believes that by providing the tools to demystify science, specifically annotations that elucidate issues in publications, the experience of learning science will become more inclusive. Annotations to texts will not only speed up the time scholars and researchers spend reading, they will also clarify scientific language, making publications more comprehensible and meaningful to the general public. We hope that if we promote collaboration and intellectual diversity within the scientific process and discussion, science will produce improved results and better serve the community. Mitar Milutinovic (@mitar_m) is a computer science PhD student at UC Berkeley working on various forms of tools for improving how people collaborate: the above mentioned PeerLibrary, nodewatcher, for empowering general population to share and build their Internet connectivity, and an as-yet unreleased project for community decision making. « Time to get ready for OKCon 2013!